Write a C program to create a singly linked list of n nodes and delete the first node or beginning node of the linked list. How to delete first node from singly linked list in C language. Algorithm to delete first node from singly linked list in C. Steps to delete first node from singly linked list. Copy the address of first node i.e. head node to some temp variable say toDelete. 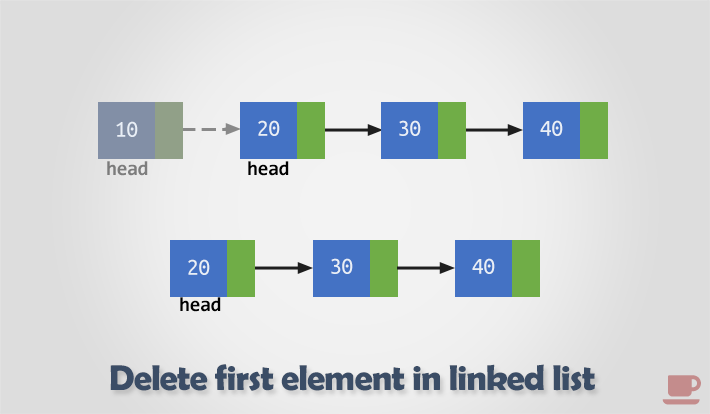 Move the head to the second node of the linked list i.e. head = head->next. Disconnect the connection of first node to second node. Free the memory occupied by the first node.